Nissan Leaf on video | What Car? 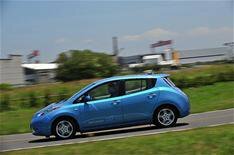 We take the all-electric Nissan Leaf for its first UK test drive. What Car? 's editor-in-chief, Steve Fowler, gets behind the wheel of Nissan's 23,990* electric car that will be in UK showrooms later this year. Steve takes the Leaf for a spin on public roads and delivers his verdict on what could be the future of motoring. Find out Steve's verdict and see the car for yourself by watching the video below. *Including Government grant of 5000.